Continuing the look back over the first decade of Barataria, this piece is from April 2007. It outlines a disease which has since consumed us – an inability to accept the need to work things out. “Politics” is a dirty word. A common phrase in our world is that we “need to keep politics out” of a given situation. It seems to come from a noble intent, which is the desire to make rational decisions that are best for everyone. But what is it that we are trying to keep out? Pope Francis has arrived in the United States. The focus on his Holiness revolves around his challenges to the American right, something that largely misses the point. There will be admonishments to the left as well when he addresses Congress and the people of our nation – and those will likely be reported with a hint of glee in the press as they search for an “objective” sense of “balance”. But that, too, will miss the point. Francis challenges all of us to step outside of our bizzy lives and see the world as a beautiful place. The message is that it is time to stop and see creation for what it is. 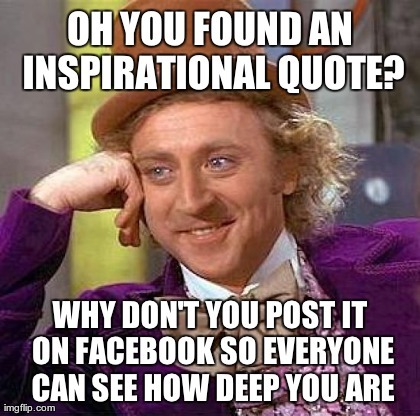 The tidbits of popular inspiration roll through twitter and facebook in a nearly constant stream. You want your stuff retweeted or shared through the networks? Come up with a bit of folk enlightenment, maybe put it into a jpg pic as a “meme” (a horrible mis-use of that word!). Keep it simple – a quick saying or maybe a set of “tips” devoid of heavy philosophy that could wear down a bizzy day. It could be a Bible verse or a simple admonishment to be a more decent person. There’s nothing wrong with this sort of stuff, and it probably has been present throughout the history of human interaction. But the volume and popularity of these sorts of things leads me to wonder if there isn’t a hunger for spirituality and connection that is missing from the ordinary grind of the day. There appears to be a missing presence in the moment, a sense that ghosts float past our conscience whispering a calling to be a better part of the world. For many reasons, I need to run a repeat today. I’ll tell you about it later. Next week will be a good one, and this actually leads off some of what I have to say well. Our current world, at least in developed societies, rarely has time for reflection. Far too often we are expected to mechanically keep going through our daily slog. The only antidote offered is selfishness, rebellion and retreat back into our own skin for a few moments of pleasure. That system is obviously not bringing happiness to many people’s lives. I would like to propose an alternative outlook on life which I will call “extasism”. My team, 2491 No Mythic, is competing in the North Star FIRST Robotics tournament. I have to resort to a repeat, but it’s a timely one that gets to the heart of this week’s posts.